It’s the kind of general statement with which most people would agree. Yet, too often, that kind of statement is used as a rationale to overstate the actual “power” of the media in politics, and then to craft regulatory or legislative remedies to deal with questions of media “diversity” or “concentration”. However, the alleged “power” of the newspapers, while not unimportant, was likely never quite as large in the past as either the newspapers or their critics would have liked to believe. And, whatever their influence may have been in the past, Britain’s national newspapers now are in the process of becoming much diminished in their ability to influence political outcomes. 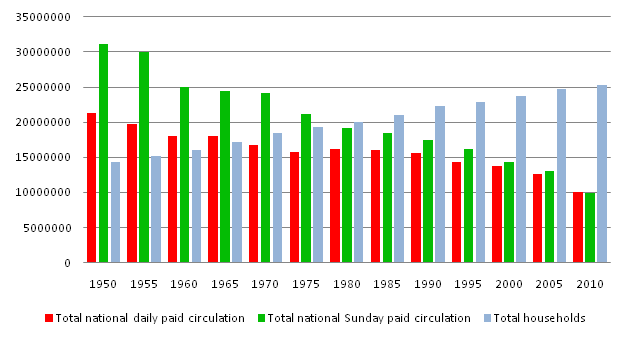 In 1950, the average daily total paid circulation for British national daily newspapers was about 21 million (equivalent to almost 150 per cent of households); the total paid circulation for British Sunday newspapers was about 31 million (equivalent to more than 200 per cent of households). By 2010, the average daily total paid circulation for British national daily newspapers was about 10.1 million (equivalent to 39.9 per cent of households); the total paid circulation for British national Sunday newspapers was about 9.9 million (equivalent to 39.0 per cent of households). The latest figures, for May 2011, show average daily paid circulation for British national dailies at 9.8 million (equivalent to 38.5 per cent of households); for national Sunday papers, the figure is 9.3 million (equivalent to 36.8 per cent of households). The reasons for those changes are manifold, ranging from the growth of television in the 1950s and 1960s to the growth of the Internet since the mid-1990s. And the Internet poses an additional challenge – not just competition for time and attention, but also the ability to “unbundle” parts of the traditional newspaper package and deliver those parts directly to consumers. Not surprisingly, recent surveys have shown that British consumers get their news from a wide variety of sources – often in multiple combinations of two, three or four media. 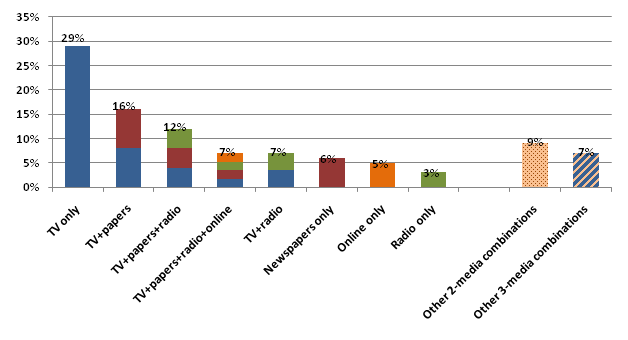 For example, as part of its review of the News Corp.-Sky transaction, Ofcom conducted a survey in November 2010 on cross-media news sources. [iii] The findings are summarized in Figures 3 and 4, and show both a varied mix of news sources for British consumers and that television is considered more important than newspapers, radio and online combined. The Ofcom survey was part of an examination of the News Corp.-Sky transaction in the context of the potential impact on plurality and/or diversity within the media. The same concerns are reflected in U.K. legislation governing media ownership. Both the U.K. Broadcasting Act 1990 and the U.K. Communications Act 2003 contain provisions that restrict the amount of a television service that a newspaper proprietor can own, if that newspaper proprietor has more than a 20 per cent share of the national newspaper market. And the market share is measured on the basis of circulation. Without getting into a debate over media cross-ownership rules, it is clear that the U.K. legislation is intended to limit some perceived “influence” that a media owner may have. But if that is the concern, a measurement based on a fixed percentage of circulation will represent a declining potential influence at a time when circulation is declining and the number of households is growing. Yet the debate about media ownership, media “slant” and media “influence” seems to go on as if it has a life of its own, unrelated to the facts about the actual or relative size of a particular medium. How often have we heard critics of the media say that the “mainstream media” don’t fully deliver some “truth” about a particular topic? Yet the critics who are making that claim do not seem to have had any trouble themselves finding (and reporting) what they believe to be the “truth” about that topic. The critics appear to be immune from a problem that they assume is affecting everyone else. Indeed, a substantial part of this type of media criticism seems somewhat elitist in nature, as the critic claims knowledge about a subject that is implicitly superior than the knowledge of the same subject by the average person, and then proceeds to criticize the media for not transmitting the critic’s view of the subject to the average person. The next step by the same critics is often to attempt to link these alleged failings of the “mainstream media” to the ownership structure of those media. All of this then gets wrapped up in a set of theories in which “press barons” or “media moguls” are alleged to have the goal of manipulating public opinion to some predetermined end – usually one that is on the opposite side of the political spectrum from the person who is levelling the criticism at the media. As we have seen in recent months, the current focus is on News Corp., and the “mogul du jour” is Rupert Murdoch. As one reviews the many articles that have been written on the subject of media, viewpoint diversity, and the relationship between media and the public, one can see two competing views of media. One view might be called the “deterministic” approach – it is a view in which ownership structure is automatically linked to “bias”, and in which media are portrayed as having a preeminent role in shaping public opinion. In my opinion, that “deterministic” approach is simplistic; and, in the case of the printed newspaper, it is also increasingly out of touch with the reality of circulation trends. In a Western democracy such as the United Kingdom, Canada or the U.S., I believe it is more useful to view media in an “environmental” context – that is, traditional media are an important ingredient in public opinion, but they share the public opinion space with many other influences, including a variety of new media, and also including home, work, school, community activities and places of worship. So what would be a balanced view of the influence of the printed press on the political process? Some influence? Of course, as part of a broader environmental set of influences. The ability to shape outcomes? Probably overstated in the past, and declining in the present and the future. First, there is a symbiotic relationship between politicians and the press (and media in general). The politicians are the subjects; they are reading (or watching or listening) to reports about themselves, so the media-political links are magnified for the direct participants. And when a direct link between newspapers and political outcomes can’t be found, then we hear the argument about “agenda-setting”; again, something that may have had some truth in the past, but is certainly less valid today, given findings like Ofcom’s about the sources and importance of news sources, and given the realities of news being broken and created on Twitter, Facebook, blogs and other social media. Second, blaming the media is a tried-and-true substitute for serious self-analysis by those on the losing end of a political contest. How many losing politicians have ever looked in the mirror and admitted that, perhaps, they did not communicate effectively; or, even more fundamentally, that the substance of their proposals may simply have been wrong or out of touch with the citizens whose interests they claimed to represent? It’s much easier to blame someone else – in this case, the media. Of course, some newspapers have also been guilty of revelling in the same kind of mythology – the famously self-serving 1992 headline in the Sun (“It was the Sun wot won it”) comes to mind. So all of this became one big feedback loop in which the politicians and the media essentially fed mythology to themselves and to each other. Let me suggest an alternative point of view – it was the voters wot did it. Finally, let me also suggest that we may come to view the current debates about “plurality” and “concentration” as wasteful diversions from a far more fundamental issue for media and democracy – fragmentation of audiences. New technology may have conquered the scarcity of channels, but that is increasingly yielding fragmented audiences based on far more choices and more narrowly-defined interests. And that could raise the most important issue of all: How will a modern democracy function if we all have less in common? [i] Robert L. Bishop, “The Decline of National Newspapers in the UK”, International Communication Gazette, June 1983, p. 208. 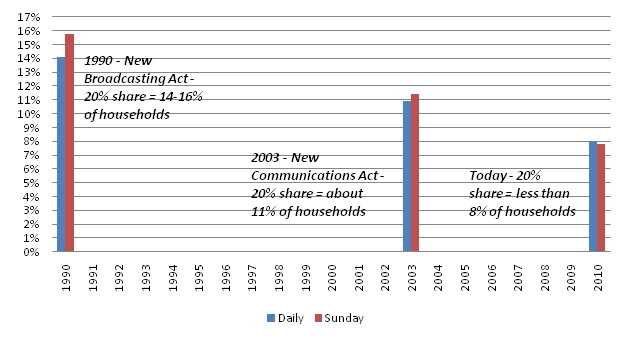 [ii] Figures 1 and 2 are based on data in Sixty Years of Daily Newspaper Circulation Trends. [iii] Ofcom, Report on public interest test on the proposed acquisition of British Sky Broadcasting Group plc by News Corporation, 31 December 2010 [non-confidential version]. For Figure 3, data come from, or are derived from, paragraphs 4.11, 4.19, 4.24, 4.32, 4.65 and 4.68 in the Ofcom report. For Figure 4, the data come from footnote 54 on page 28 of the Ofcom report. 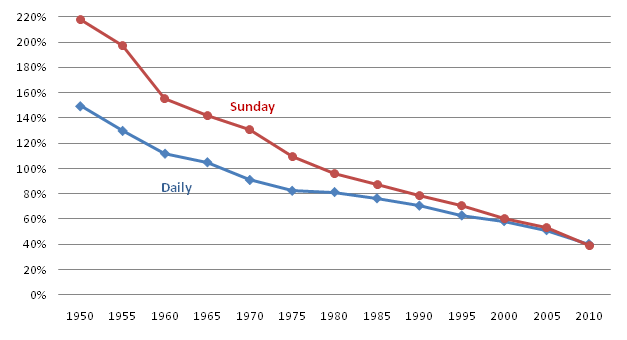 [iv] Figure 5 is based on data in Sixty Years of Daily Newspaper Circulation Trends. [v] Roy Greenslade, “Election 2010: What influence do newspapers have over voters”, The Guardian, 3 May 2010 [accessed online]. [vi] “60% of Dailies Support Dewey; Roosevelt Backed by 22%”, Editor & Publisher, November 4, 1944, p. 9. [vii] Statistical Abstract of the United States 1951, p. 294.